Edit: This was funny in 2017 and became a terrible reality in 2018. What is being done to people who just want to immigrate to a country where they can be safe is wrong. What is being done can never be forgiven. #FireDazedOct2017’s Spooky Forest prompt that I am also late for. This has not been a good month for being timely. :p Anyway, I have in my hands the Bundle Monster Happily Never After set and it has the image of a baby in a bird cage. It also has several images for the witch in Hansel and Gretel. 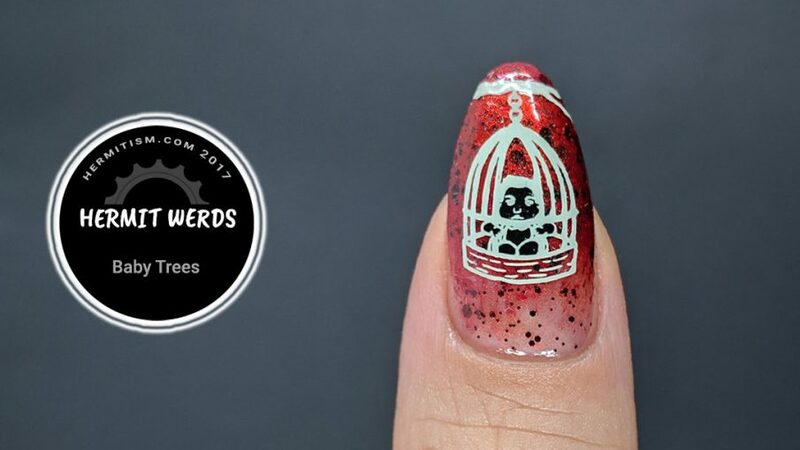 So I decided to combine these with another lovely image of a tree with bird cages hanging from it and make a different story. Does the cruel witch hang babies in cages from this tree or is the tree a trap and the babies only an illusion? Maybe she is the hero trying to rescue them. You will have to decide. 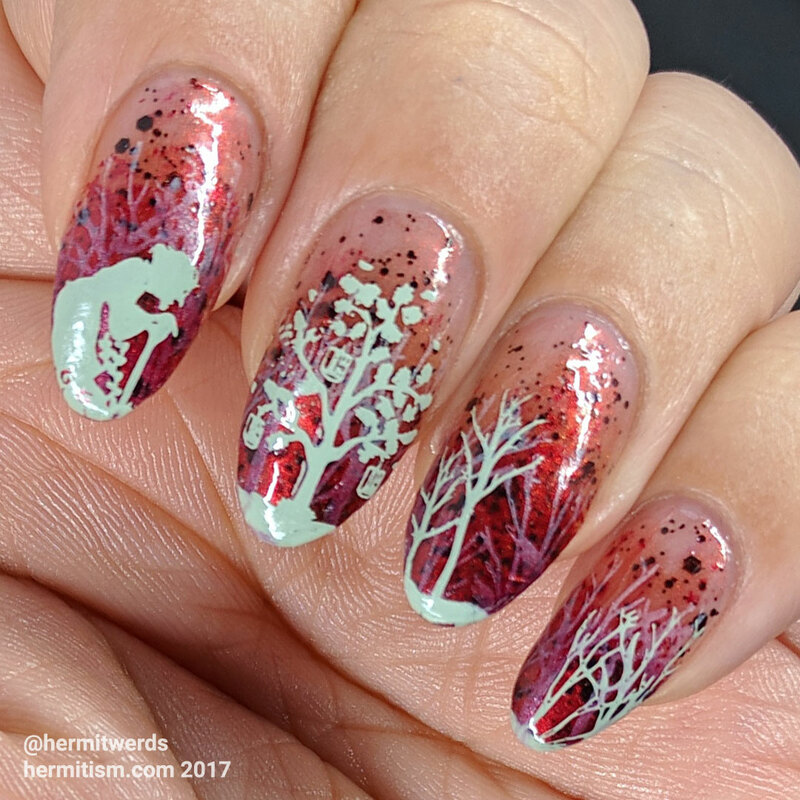 One of the reasons why I am so late is that I loved the base of this so much that I delayed stamping on it for a day. What really made this is the only Sinful Colors’ Halloween polish I bought this year: “Bite Me”. I adore it. It’s more of a shimmery topper with black glitter. Now they did come out with a matte, opaque, red shimmer polish called “Undead Red” that’s sold exclusively at Walmart. It’s pretty and looks like it has a great formula, but I just…don’t need it. Meanwhile, Sinful Colors has terrible glow in the dark polishes so those were out. 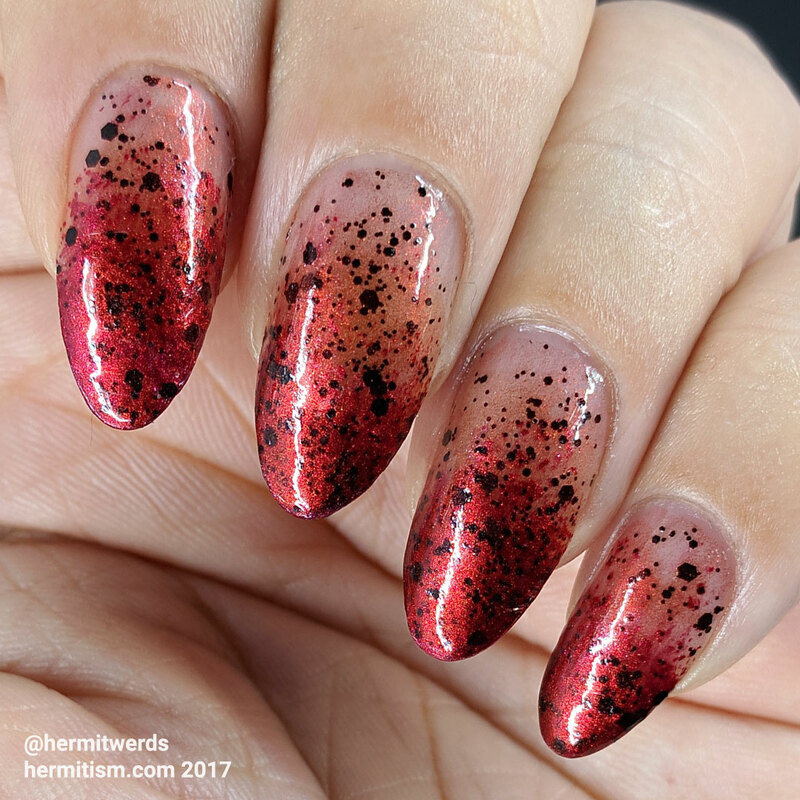 If You’ve Got It, Haunt It is a noisy glitter combo that I won’t use (too noisy for the art part of nail art). So the only other truly Halloween polish I would have purchased is Devil’s Stare which they’ve released before so I already own it. It’s lovely. I need to dig it out before the month is over. The rest of the collection is more from their core line. I do appreciate that Sinful Colors includes them and re-releases in these collections. It helps people connect with season-appropriate colors they may not have and also serves to remind me that I have lovely toys to play with already.